Thank you Cultural Landscape Foundation! Click here to read their report "Lord and Schryver Conservancy Reaches New Milestones"
Because the Conservancy is dedicated to the preservation of the legacy of Elizabeth Lord and Edith Schryver, we are seeking garden lovers who may consider purchasing a home with a garden designed by these extraordinary women. To the left is a listing of a home with Lord and Schryver gardens that is for sale. 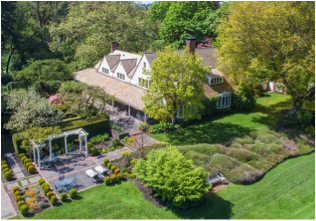 The Conservancy derives no financial benefit from the sale of these homes but we do encourage the preservation and restoration of these gardens. Some of these homes have gardens that are much as they were when originally installed; others have gardens in need of restoration. We would be pleased to confer with the new owners about the design and significance of their garden, and share our knowledge of historic documentation related to these gardens. If you know of such properties for sale, please contact us. We will attempt to keep these listings up to date. Thank you for your interest.